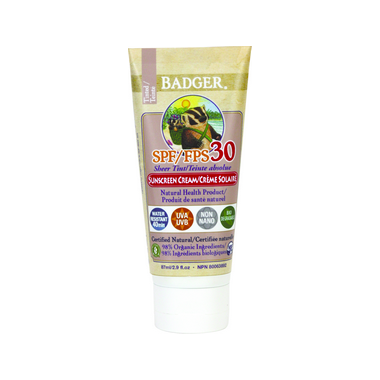 Badger SPF 30 Tinted Sunscreen Cream provides safe, effective, and responsible protection from the sun’s damaging rays. Great for the whole family, this moisturizing and water-resistant (to 40 minutes) sunscreen has a sheer tint for face and body (blends with most skin tones) and no added essential oil fragrance, so it’s suitable for use on even the most sensitive skin. Blocks both UVA and UVB rays with non-nano uncoated zinc oxide – the safest, most effective single mineral active ingredient. Retains the subtle, natural scent of organic beeswax. These tubes are made of BPA- and Phthalate-free #2 recyclable plastic. Simple natural sunscreens with no added fragrance. Directions: Knead tube before each use. For full protection, apply liberally (2mg/cm2 of skin) to all exposed skin 15 minutes before sun exposure, then rub in to reduce whitening effect. For children under 6 months of age: ask a doctor. After 40 minutes of swimming or sweating. Immediately after towel drying. At least every 2 hours. Natural and itâ€™s a good protection all the year. Itâ€™s my second purchase. I really wanted to love this because it's tinted. I have very pale skin before getting a tan and I thought the tint would be darker to combat the white cast from the zinc. This one's too light for me!!! It made me look whiter than just using the other zinc based Badger Sunscreens!!! Still works as a great sunscreen though. Perfect to avoid white zinc marks, but still heavy on the skin. The tint is excellent, blends into the skin and leaves no white look. I do find it takes a good 10 minutes to absorb and has a slightly oily texture. A little goes a long way! I think I look a little pÃ¢le when I apply it, but it leeves my face with such a a nice texture. Not greasy or thick so goes on easily and blends well. Nice neutral tint. Great coverage and my partner uses it too, as the light tint blends with both our skin tones and doesn't give that white chalky look that most natural brands can have. I wanted to love this. It's a bit drying but it's 100% mineral and great for my very reactive, sensitive skin. But alas, the white cast is too strong for my NC25 skin tone. I will pass this on to another person. I bought this and Badger's Sport Unscented. This one is 100x better than the Sport version because I don't look like a mime. The sheer tint provides some coverage of facial redness. I was worried the tint would be too dark because I have a porcelain skin tone, but it blended in quite nicely because is it somewhat sheer. I love that there is no obnoxious sunscreen smell, it doesn't give me any allergic reactions or irritate my rosacea. The one thing I noticed is to make sure your face is exfoliated or else the sunscreen will show on dry patches. I will probably only use this on my face because I'm worried the tint might stain clothes, but I'll use their other unscented sunscreen cream for my body. Good product. It spreads about as well as a natural mineral sunscreen can be expected to and the tint really helps lessen that visible chalky layer often left behind. I'll be buying again. was really looking forward to trying this because i hate the ghost look of zinc sunscreens but don't want to use chemical sunscreens. i like the tint but the product is very thick and dry (not enough 'essential oils' grease in it) that it negates having the tint because instead of a white buildup in creases of the skin (ie. on sides of nose) i get a beige buildup so it looks like i am wearing heavy foundation in those areas. i had to blend it with a zinc spray that i have that is very greasy in order to blend better. it's not bad though, no fragrance which i like. Have been trying out different natural sunscreen and still love Badger. This one is tinted, I tried it on my face and didn't cause any acne so far. It even out skin tone slightly. Also, doesn't has the whitening effect like most natural sunscreen. Will continue to use. The tint is fine but it's a bit tacky. I don't have that much experience with natural sunscreens. But I think most feel sticky. This one is no exception. But I didn't get a sunburn!